A decade ago, the issue of disability was nowhere on the global agenda and the need to address this was barely understood by the world’s decision makers. For instance, the Millennium Development Goals (MDGs) contained no reference to persons with disabilities. The more than 1 billion persons with disabilities, including mine survivors, were viewed as a burden, as objects of charity and treatment. Fortunately the last ten years have brought about a paradigm shift among the world’s leaders on the issue of disability and today this is recognized as a global issue of concern that needs to be addressed. This evolution would not have been possible without the adoption of the 2006 Convention on the Rights of Persons with Disabilities (CRPD) and the determined efforts of those who fought relentlessly for the creation and adoption of this Convention. 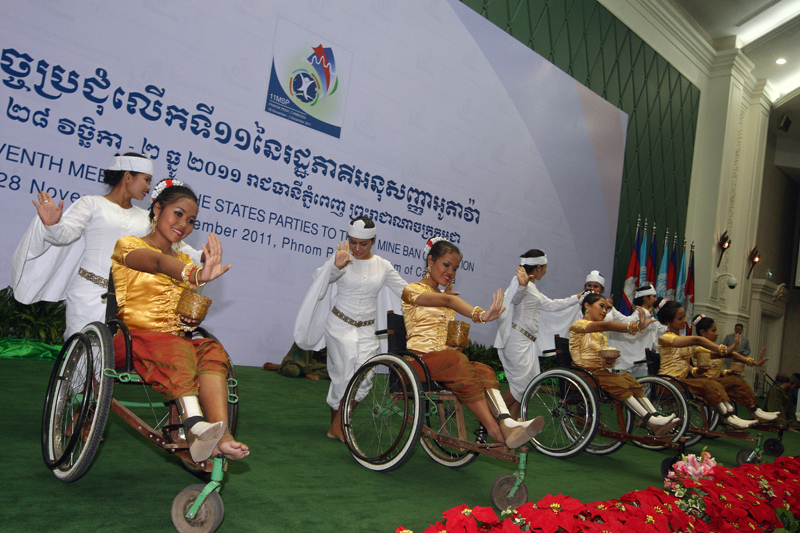 The 1997 Mine Ban Treaty (MBT), the first disarmament regime to recognize the rights of an indiscriminate weapon’s victims and the 2008 Convention on Cluster Munitions (CCM), which contains a ground-breaking provision on victim assistance, have contributed enormously to the recognition of rights of persons with disabilities at the international level but also and most significantly among landmine and cluster munition affected countries. The UN General Assembly High-Level Meeting on Disability and Development (HLMDD), which took place on 23 September, marked a milestone in the promotion of the rights and the needs of persons with disabilities in the context of the MDGs. After the adoption of the CRPD in 2006, this is the first time that rights of persons with disabilities have been discussed at the highest level within framework of the UN agenda. Civil society at global and national levels (including members of the ICBL-CMC) contributed substantially to preparations for the HLMDD. Persons with disabilities were among the leading organizers of this initiative. Mr. Yannis Vardakastanis, a representative of persons with disabilities, called on the international community to make sure that “persons with disabilities are able to fully enjoy their rights on an equal basis with all other citizens of the world. Inclusion, non-discrimination and equity must be the driving principles on which the new global development agenda is framed,” Vardakastanis said. These principles are included in the outcome document. The HLMDD and related developments have strengthened the efforts in the framework of the MBT and the CCM to address the needs of landmine and cluster bomb victims. Similarly, the experiences gained through implementation of these two treaties have also contributed to promoting the rights of all people with disabilities. The outcome document will help efforts for further synergies between disability and victim assistance. My hope is that all States Parties to the MBT and the CCM use these opportunities to step up their efforts in fulfilling their victim assistance obligations. This focus will be particularly important in the lead up to the crucial Third Review Conference of the MBT, which will take place from 30 June to 4 July 2014 in Mozambique. I also hope that states strongly support the full inclusion of rights of persons with disabilities in their post-2015 development frameworks. I would like to send my heartfelt thanks to all of my colleagues with disabilities who have been vigorously fighting for recognition of our rights and ensuring a life with full dignity for all persons with disabilities! I am proud of our continued contributions in promoting the rights of landmine and cluster munition survivors and other persons with disabilities. We have achieved a lot so far and we have a lot more to do for full realization of our rights! Perhaps you could post a story on the newly released web version of the CM ID tool? Please do not hesitate to contact me or Christine (Cc’d) for information.